Rabbi Yitzhak claims that everything that later prophets would say was in some way uttered or revealed during the revelation at Mount Sinai. The words of Samuel or Isaiah or Amos or Zechariah were uttered at Sinai. Which is to say that the power of their prophecy derived from the Sinai revelation. Or, the insight of God that they understood in their own time had its roots in the God’s appearance to Israel at Sinai. In witty fashion, the prooftext he uses for this claim itself comes from a moment demonstrably after the Sinai revelation: 40 years later when Moses is taking his leave of the people. And yet, according to Rabbi Yitzhak, Moses’s words then are likewise an elaboration of the Sinai moment. Like Rabbi Yitzhak’s earlier assertion, the Midrash here goes even further in articulating that the essence of the moment of Sinai was paradox. 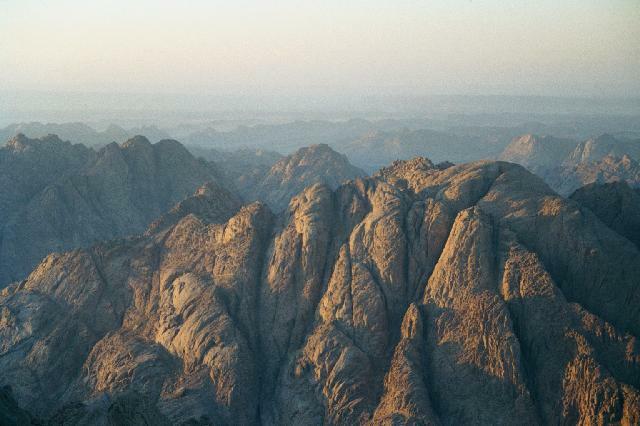 Sinai was the moment of profound unity, not only in history, but in all human experience. It is the taproot of prayer, as the Midrash suggests by referring to God’s ability to answer the prayers of people in far-flung places all at the same time. And it is the moment when those present had some insight into the parts of life and the universe that are beyond our ability to explain: the presence of good and evil, the mysteries of light and darkness. As we say every Friday night, Sinai was the moment when language itself was transcended: “Shamor v’zachor b’dibur echad,” ‘Keep’ and ‘Remember’ [the Sabbath day; cf. the Exodus and Deuteronomy accounts of the 10 Commandments] were uttered in one word. Rabbi Yitzhak claims that all prophecy has its roots in this moment. But other thinkers, most prominently in Hasidus, go further. “And these words which I [anochi] command you today [hayom]” (Deut. 6:6) means that Anochi, the same Anochi as in the first word of the Ten Commandments, speaks to us every day. Every day can be Sinai, not only for the prophets, but for us–we who were not at Sinai, but who, according to the Midrash, really were. Sinai then is not something far off, something remote and separate from us. It is something we can experience every day, if we learn to stop and listen and look for it. You wrote to me this morning asking for guidance about how to respond to the death of Osama bin Laden. I’m glad you asked this question, and I’m glad you have the moral sensitivity to engage it. It’s important to remind ourselves of who Bin Laden was and what he sought to do. Bin Laden was a mass murderer on an enormous scale. He was a man of hate, and he caused untold death and destruction to human beings around the world, let alone to America itself. There is no eulogy for him. So our first response is that of the Bible’s Book of Proverbs which states, “When the wicked perish there is song” (Prov. 11:10). To see wickedness removed from the earth, to see evil stopped, is a joyous thing. We are thrilled, just as the Jews were thrilled when Haman was stopped, just as Americans were thrilled on V-E and V-J day. Our response is one of thanks and gratitude and joy. At the same time, as your question itself suggests, something feels weird about celebrating death. It feels somehow unseemly to many people, a violation of the spirit in which we removed the wine from the second cup at the seder just two weeks ago. As the midrash recounts, as the Israelites sang at the sea after the drowning of their Egyptian enemies, the angels were about to start singing when God reproved them saying that God’s own children were dying. This impulse evokes another line in the Book of Proverbs, “Do not rejoice when your enemy falls, and do not let your heart be glad when he stumbles” (Prov. 24:17). Yet I think here it is important to remember two things. First, as a colleague of mine reminded me, the enemy in question in the verse may not be an Osama bin Laden type of person—it is more likely your neighbor with whom you bicker, or your roommate who you can’t get along with. Butchers of the variety of Bin Laden are in a different category. We can sing at their downfall. Second, the standard of not singing recorded in the midrash is a standard for the angels, not for us. Neither God nor Moses gets angry with the Israelites for singing. Quite the opposite: Moses’s sister Miriam is the one who gathers the women and exhorts all the children of Israel to sing. The midrash is making a theological statement about a reality that may exist in the mind of God. But as the Rabbis state many times, the Torah speaks in the language of human beings. It responds to human realities and human emotions. God and the angels do not have to deal with death the way that humans do. There is nothing wrong with celebrating the death of those who seek to kill us. Christianity has given us a radical conception of love, and I would refer you to my Christian colleagues about how their tradition shapes their response to Bin Laden’s death. Jewish tradition acknowledges that evil exists in the world, that evil people exist in the world, and that we must be unflinching in countering them. There is no room for moral paralysis when fighting a man like Bin Laden. You point out that this news comes on Yom HaShoah, Holocaust Remembrance Day, and you ask, rhetorically, what our reaction might have been to the death of Hitler. There is no question there. Bin Laden was not Hitler, but not for lack of ambition. We celebrate his end—not necessarily with parades and balloons, for his demise cannot bring back those whose lives he ended. But we are happy that a man who perpetrated such gruesome crimes against our nation, and sought to do so against our people and all of humanity, is no longer among the living. One of the most important and rewarding parts of my work as a Hillel rabbi is studying Torah with students. In addition to the talks and discussions I regularly lead, over the years I have maintained many individual havrutot, or study partners, with undergraduates. The topics under study have ranged from the Bible to Mishnah and Talmud to Jewish philosophy. And while it is a commonplace among Jewish educators to invoke the Talmudic saying, “I have learned from my students most of all,” there’s a reason it’s a commonplace—it’s true. This year one of my student havrutot is a philosophy major, and we are learning the Mei Hashlioach of Rabbi Mordechai Yosef Leiner, the nineteenth century Hasidic master also known as the Ishbitzer Rebbe. Mei Hashiloach is a commentary on the weekly Torah portion. But it is not so much a commentary as, like other Hasidic works, a creative meditation on big, eternal questions, by means of the words of the written Torah. While he is beautiful and provocative, the Ishbitzer is also incredibly challenging—particularly if you are a linear thinker looking for a scientific sort of analysis. One of his main theological premises is that human beings are ultimately vessels for God’s will. In one of his more famous formulations, he suggests that Zimri, the Israelite who was publicly fornicating with a Midianite woman and was killed by the priest Pinchas in an act of righteous zealotry (see Num. 25), was not actually sinning, because God had willed it. This line of thinking is where the Ishbitzer crosses a line into dangerous territory. But in other places, he offers compelling challenges to the ways we traditionally approach Torah and the world. As I wrote a few weeks ago, the Ishbitzer’s commentary on the revelation at Sinai is breathtaking in the way it meditates on the limits of language and history. His approach to the Mishkan helps us see the deeper questions in its symbolism: What does it mean to have a body? How does the symbolism of clothing and furniture help us experience the gap between our desires and our ethics? Parshat Ki Tissa, recounting the incident of the Golden Calf, provides yet another twist on these questions. How can we, who have bodies, who think and speak in language, relate to a God who doesn’t have a body, who exists beyond time, space, and language? Going further, into the real heart of Ki Tissa—Moses’s incredible encounter with God, and God’s act of grace in forgiving the people of Israel—the Ishbitzer prompts us to ask, How do we understand God’s forgiveness? How do we understand our own capacity for righteousness and grace, which exists alongside our capacity for self-interest, exploitation and sin? Particularly for the Ishbitzer, who sees God as the force behind everything, how do we understand the gap between our potential and our reality? His answers can be beguiling. God created Moses with the attributes (middot) to be able to accept the words of Torah, he says. And at the moment of Moses’s plea for the people, God recognized those attributes in Moses and showed him grace. It’s confusing: Why does God need to recognize those attributes in Moses, if God was the one who put them there? Doesn’t that suggest that God forgets God’s own actions? And isn’t that a problem if God is all-knowing? My havruta and I circled around this question repeatedly during our hour reading the Mei Hashiloach. I tried to suggest that this linear approach—trying to understand the sequence of events—was not going to work, because it’s not following the questions of the Ishbitzer. He isn’t trying to explain what God is, he isn’t engaging in speculative metaphysics. He’s offering a meditation. It’s more poetry than prose. At this stage of my life, the question “What is the nature of the universe?” is less important to me than the question, “How does this approach help me live a better life?” Perhaps this betrays my philosophical affinity for pragmatism, a la William James or John Dewey. Perhaps it also represents a certain surrendering of control: in seeking to explain the universe, we often seek to control it. By easing off on the quest for explanation, and accepting the fact that I cannot really ever know the workings of world with certainty, I find I can actually get to a more fruitful place in being a servant of God. Yes, this news was amazing because it complicated an already very busy day in our office. But what’s even more impeccable about the timing of this incident is how it coincides with the mainstreaming of hateful religious rhetoric in American public conversation. The New York Times this morning reports on an emergency interfaith summit of religious leaders to respond to the rise in hate speech. The epidemic is epitomized in the planned burning of the Koran by a church in Florida this weekend. As Rabbi David Saperstein of the Religious Action Center of Reform Judaism put it, As Jews we know religious persecution. We know book burnings. Now is a time to speak up. Rosh Hashanah is our most universal holiday. Unlike Yom Kippur, which emphasizes the unique covenant between God and the Jewish people, Rosh Hashanah focuses on God’s general covenant with humanity. The liturgy implores God to remember Noah—the father of all of humanity that remains after the flood. It refers to today as the birthday of the world. It is the anniversary of Adam’s creation, the creation of all humankind. The themes of Rosh Hashanah are general, and focus on what it means to be human, and only secondarily on what it means to be Jewish. Rabbi Jonathan Sacks has written eloquently over the last decade about what he terms the ‘dignity of difference,’ the capacity to hold, acknowledge, and celebrate our deepest differences. In one of my favorite passages from his book of the same name, Sacks asks, what would the experience of faith be like in a world in which the dignity of difference was truly enacted? ““It would be like being secure in one’s home,” he writes, “yet moved by the beauty of foreign places, knowing that they are someone else’s home, not mine, but still part of the glory of the world that is ours.” Emphatically, Sacks rejects the notion that pluralism involves surrendering our uniqueness. Adaraba—just the opposite: in order to live together, we need to do with and through what makes us different, not by erasing it. We need to be secure in our own homes—our familial homes, our communal homes, our national homes and simultaneously concerned for and engaged with the homes of others. That is the challenge of brotherhood, which forms one of the themes of the Torah reading of Rosh Hashanah. The question asked by the story of Ishmael and Isaac, of Hagar and Sarah, is this: how can brothers get along? It is the question of Genesis, and the question of the Bible more generally: how can we recognize that we share a common ancestor while simultaneously acknowledging and accommodating each individual’s uniqueness? How can we reconcile the tension implicit in the idea that human beings are created b’tzelem elokim, in God’s image: one the one hand we are all equal, on the other we are each unique? In the title of another of his books, Sacks puts forward his answer: The Home We Build Together. When we build a home together—not simply live next to one another as guests in someone else’s home, nor rent a home that belongs to a common landlord, but actually build a shared home—we forge a covenant. His model is the mishkan, the Tabernacle built by the ancient Israelites. Every member of the community contributed to its construction. Everyone had a stake in it. And thus it created a physical, psychological, and spiritual center for a people. And today it continues to provide a model for what a society can be. “Society is made out of the contributions of many individuals,” Sacks writes. “What they give is unimportant. That they give is essential.” The home we build together is society. The Rosh Hashanah liturgy famously refers to three essential acts of the High Holiday season: teshuva, tefilla, u-tzedakah – repentance, prayer, and charity. Central to each of these acts is a spirit of openness. Teshuva is not possible unless we are open to critique of ourselves. We can only engage in tefilla if we are open to the presence of God in our lives. And tzedakah requires an openness, awareness, and concern for lives beyond our own, and an actual, tangible act of giving and generosity. These are the acts of restoring and renewing our covenant—between God and Jewish people, but, particularly on Rosh Hashanah, between God and the world. Today is the birthday of the world—the whole world, and all its inhabitants. Today, and every day, our spirit of generosity begins with ourselves, our families and our communities, but ultimately extends to all of God’s creation. It’s hard to write these words without sounding almost a little trite. But let me be clear: the challenge here is to both liberals and conservatives, to those who would reject religion altogether and those who would retreat into narrow and exclusionary religious perspectives. As Eboo Patel, founder of the Interfaith Youth Core (and a friend and colleague) has powerfully argued, this is the moment for a new approach to interfaith understanding and cooperation to emerge. We have a choice between producing a generation of religious extremists rooted in hatred, or a generation of religious peace-makers, rooted in the dignity of difference. On this Rosh Hashanah, on this Shabbat Shuva, our choice is clear: u’vacharta ba-chayim, Let us choose good. Let us choose life. Let us drown out the hatred of the few with the openness and brotherhood of the many. There’s a compelling piece in this morning’s eJewishPhilanthropy about the sad reality of how little Jews think of their rabbis. The writer, Adir Glick, refers to a survey by the Elijah Interfaith Institute (no link provided, unfortunately) that shows that Jews have the lowest opinion of their religious leadership among all world religions. Glick links this to Jews’ rejection of their own religious life and embrace of others, such as Buddhism.